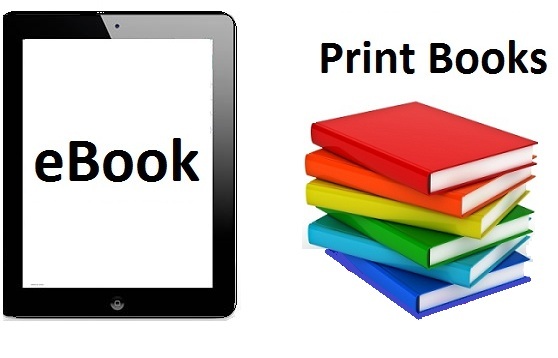 What are the differences between eBooks and print books? As the name suggests, electronic books are books that are presented in electronic formats and displayed on electronic devices such as; computers, tablets, phones, phablets and iPads. On the other hand, print books are books presented in print form, i.e. paper form. The modes of presentations already hint to us that there are significant differences between eBooks and print books. We will get to learn more differences as the paragraphs below unfold. eBooks are relatively cheap compared to print books. Low cost is because the publishing of eBooks only requires computing devices which can be cheap to acquire and utilize. eBook authors and publishers only need computer hardware and software to come up with very fruitful and marketable content for different reader audiences. On the other hand, print books need a lot of investments inform of handheld tools. These devices are expensive to acquire and maintain and this is the reason why we do not have publishing and press houses everywhere. The print books have to be relatively costly to generate reasonable returns to authors and publishers. eBooks have a long life compared to print books. It is because an eBook will be in existence as long as the electronic device. Furthermore, an eBook can be backed up and stored in the cloud; this means that an eBook stored in the cloud will be in existence forever! On the other hand, print books are subject to a lot of damages. The can be wet or even get torn in the process of handling them. The life of an eBook also depends on the quality of the paper used in printing its page, if the papers are of an inferior quality, they tend to get dumpy, and words start becoming blurred over an extended period of time. An eBook formatting is very different from a print book formatting. Trying to make an eBook format be the same as the format of its print book version will only frustrate rather than help a publisher and an author. eBooks do not support; tabs, columns, symbols, paragraph returns, colored fonts, and spacebars in their formatting. On the other hand, print books gives publishes a maximum control of the layout since they support the various components mentioned above such as paragraph returns. Page numbers are therefore irrelevant in eBooks compared to print books since eBooks are readable on different supporting devices. What about portability and interactivity? eBooks are highly portable compared to print books. It is because you can walk to your entire eBook library in your device, unlike your print book library from which you can pick one or two books to carry along with you whenever you travel. The ebook is, therefore, convenient to frequent readers who are always traveling from place to place far away from their physical libraries. When it comes to interactivity, the print books have it. With print books, readers can interact with the presented content in almost all their senses; these include vision, touch, and even smell. The readers of print books can, therefore, grasp much content from their reading compared those of eBooks. Find out much more from us! We are one of the leading publishing services providers company on the globe; we deal with some quality services such as eBook conversion services. If you are a publisher firm or a self-publisher in sought of quality publishing services, feel free to contact us as well as visit our offices for further discussions. PreviousPrevious post:What is Print on Demand and How It Is Useful For A PublisherNextNext post:What devices does Calibre supports?